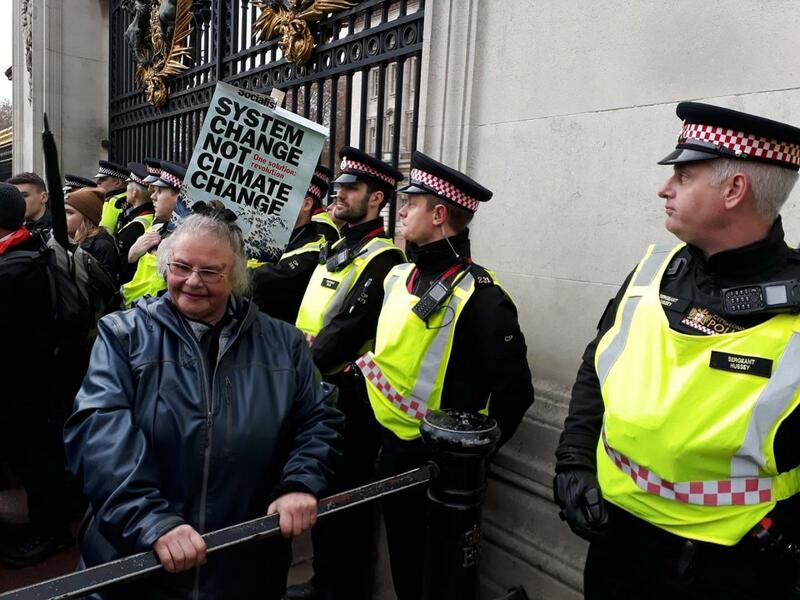 Extinction Rebellion has brought its message to Her Majesty the Queen, one activist is currently superglued to the gate, with another willingly arrested for spraying the extinction symbol on the ground in front of the gates. Around 2,000 Extinction Rebellion activists were gathered in front of the Palace - with a coffin symbolising the death sentence facing the next generation - and have now divided into separate groups to undertake autonomous actions. So far today there have been 14 people willingly arrested for criminal damage in order to highlight the criminal inaction of the British Government in the face of imminent ecological and climate emergency. Dr Gail Bradbrook read out a letter addressed to Her Majesty the Queen, Mrs Saxe-Gothe-Coburg: “We are facing the biggest threat to our entire realm and way of life in 1,000 years of our history. We know our rights and are in rebellion to save ourselves, our loved ones and our entire nation. We have asked our government to meet with us and address our demands. “With great humility we now come to Your Majesty to implore you to act on our behalf: to fulfil your sacred duty to protect the realm. If you do not protect us from these perils the Social Contact between us shall be broken. It will become our sacred duty to rebel and replace our government with one which honours the first duty of any state: To protect its citizens, their lives and livelihoods. We earnestly implore you to understand that we are more serious about this than anything else in our lives.